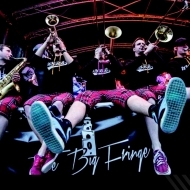 Prepare to be blown away by the exuberance of this popular and classy band at the forefront of the funky jazz brass revolution sweeping the UK. This septet packs a powerful punch playing music that gets people on their feet, making the audience feel part of the show. These musicians will perform an outdoor ‘Party Set’ in Castle Square in late afternoon as a warm up to their show in the Blue Room later that evening.